Have you ever wanted your home to stand out among all the other homes near you? The best way to bring a different feel to your home is by making a one-time purchase of a wrought iron front door. Homeowners don’t realize the Advantages of an Iron Front Door. 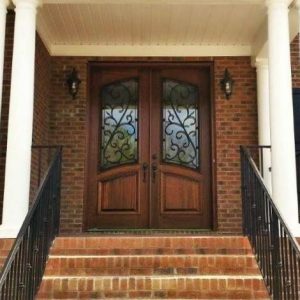 Iron doors are a popular option for Southern Front Door customers throughout Houston. The front door is the first impression any visitor to your home There is an incredible selection of front doors with amazing custom details for customers. An iron front door is quite an investment for any homeowner however, this is a one-time only purchase. This is not a recurring monthly expense that homeowners have to endure. Advantages of an Iron Front Door include adding a layer of security to your home thus, an effective deterrent against potential thieves. Did you know that doors made of iron have been used for centuries in government building and castles? These remarkable doors have a place in our history which is why it is no surprise that homeowners are turning to iron doors for protection. Not only do iron doors protect, but they are also fire resistant and strong. Iron doors provide safety, protection and have an aura of timeless artistic beauty. 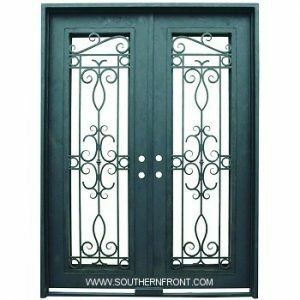 Your wrought iron door from Southern Front Doors is made of thick, 14-gauge iron. With our extensive treatment process, Advantages of an Iron Front Door is the door maintains its beauty and strength for a very long time. Glass options on iron doors are stunning. As a bonus to homeowners, glass panels open on most models. Panels that open make it easy to clean, speak to visitors or to let fresh air in. We will not be undersold! You can compare apples to apples and doors to doors with that said, you now know that Southern Front Door is in a class by themselves. We have an outstanding showroom where our customers can take Advantages of an Iron Front Door to customize their purchase. Southern Front Door has over 10,000 entry door styles as a result, we can fill any of your door needs. In addition to the remarkable selection, we have our own pre-hang and prefill department. If you walk into our show-room and know exactly what you want but, you do not see it, we have a professional to make it happen. We are located on the north side of Houston, 11234 Jones Road West Suite B Houston, Tx. 77065 (281)-890-5860. Visit our website. Come in and be a part of the family!